We're dedicated to providing extensive medical treatment for multiple conditions of the foot and ankle. We strive to provide thorough podiatric education and treatment to ensure that our patients walk away both knowledgeable of their condition and well cared for. If your foot has a funny-looking bump on the side near the big toe, and it sometimes hurts the bump to wear shoes, chances are that you have a bunion – or even two. Several common conditions afflict people and ruin their nails, making them thick, brittle, and deformed. You don’t have to hide your toes away! 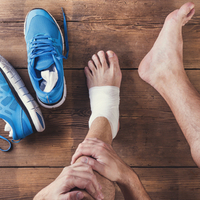 Sometimes there’s an undeniable “ouch” moment, when you’re pushing your body to its limits and you suddenly know that something has gone terribly wrong with your foot or ankle. Few things are more important to a parent than your child. You care about their interests, activities, education, and especially health. As a parent, you want only the best for your child when it comes to their foot care. Rheumatoid arthritis, which afflicts approximately 1.5 million Americans, can affect more than your joints, and it is important that you seek treatment right away if you believe you suffer from this condition. Copyright ©2019 Lanny S. Foster, DPM. All Rights Reserved | Built by K2 Media, LLC.